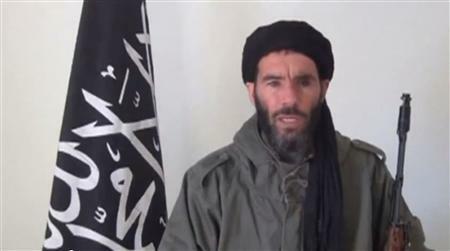 A notorious al Qaeda commander named Mokhtar Belmokhtar has claimed credit for kidnapping more than 40 foreign nationals at a natural gas field in eastern Algeria today, according to multiple press reports. A Frenchman, a Briton, and an Algerian security guard are reported to have been killed in the initial attack. Seven Americans, five Japanese citizens, and several Europeans are said to be among those who are being held hostage. The precise number of hostages remains murky. A spokesman for Belmokhtar’s terrorist organization, the al-Mua’qi’oon Biddam (Those who Sign with Blood) Brigade, said the assault and kidnappings were retaliation for the French-led invasion of neighboring Mali. “Algeria’s participation in the war on the side of France betrays the blood of the Algerian martyrs who fell in the fight against the French occupation,” the spokesman said, according to a translation provided by the SITE Intelligence Group. “This invasion comes in the global campaign of fighting the Jews and the Crusaders,” the statement reads, echoing al Qaeda’s many calls for global jihad. Belmokhtar, who is also known as Khalid Abu al Abbas, long served as an al Qaeda in the Islamic Maghreb (AQIM) commander, but had a falling out with the group’s senior leadership. Late last year, he formed his own splinter group, but that group still answers to al Qaeda’s senior leadership. In an interview with the Associated Press in December, one of Belmokhtar’s confidants confirmed the move and explained his motivation. Belmokhtar was designated an al Qaeda-affiliated terrorist by the United Nations in 2003. The UN described him as “a former Algerian soldier with experience in training camps in Afghanistan” and explained that he had belonged to the Salafist Group for Call and Combat (GSPC), as well as its successor, al Qaeda in the Islamic Maghreb. Belmokhtar has compiled an extensive dossier of illegal activity, according to the UN, including kidnappings, gunrunning, robbery, “forming terrorist groups,” and murder. He also reportedly runs an extensive cigarette smuggling operation. In March 2008, an Algerian court sentenced Belmokhtar “in absentia to lifetime imprisonment for the murder of 13 custom officers.” In December 2008, he was involved in the kidnapping “of two Canadian diplomats working for the United Nations.” Dozens of other kidnappings also have been attributed to Belmokhtar. Ok so this Mokhtar Belmokhtar is a two-bit cigarette smuggler. Now he’s expanded his operations to kid-napping and ransom. I’m not downplaying the problem/severity of this incident and the overall threat posed by AQIM in Africa, but I am questioning this guy’s motives. Is he a devout Jihadist or an enterprising opportunist? Whatever he may be, this is now a huge mess for France/US/NATO/The African Union to deal with. Time to call in a SEALs direct action plt. Is Algeria handling this alone, or they giving it to another country or group of countries? I find it extremely disturbing that more significant efforts weren’t taken to prevent this incident from happening. The Algerian Civil War is well documented & the GIA is well known as well is their pledged allegiance to al Qaeda. A fine mess you landed us into as hardy would say….the americans initiated this jihad into the illiterate afgans in the 80’s to get their inherited craziness out….. now it has turned on them……. America brings thousands of muslims to the US on immigrant visas and in essence you have created —– enemies among your own midst. they – no matter what they say of peace and integration — are not like any other immigrants in the US….. watch your back folks and stay armed. @Larry, the fact is tat until the West gets the guts and good sense to properly deal with these Islamic Jihadist Scum, their evil and barbaric ways will continue. Unconfirmed sources are saying that 34 hostages died under a failed rescue attempt, and 15 of the terrorists were killed. More unintended consequences, in my view, from the Libyan fiasco. This attack is nothing new, anyone who has been following North African security issues closely knows that there has been a Islamist insurgency in Algeria since the early 1990’s. It has become more radicalized over time, and these types of attacks on foreign workers in Algeria have occurred with some frequency in the past. The number of hostages taken though is what makes it stand out from past incidents. The war in Mali is merely the largest campaign in a greater conflict that is being waged across all of North Africa. Media reports that this attack has internationalized the conflict are bogus, the conflict was internationalized more than a decade before the French even invaded Mali. Good perspective Will. Did the Algerians study at the Kaiser Soze school of Hostage negotiation? A gunship assault. Really? Algeria’s response was predictable. They have been dealing with these types of jihadis for over a decade. The Algerian armed forces are brutal. More importantly, the Algerian government is concerned about the infrastructure (industrial plant) more than the personnel. It accounts for a lot of money into their coffers. @Matt, not just the Libyan fiasco but the entire Arab Spring fiasco which essentially gave North Africa to the Sunni Islamists, with Syria poised to soon fall into their hands as well. The Iraq fiasco opened the door for Shia Islamist (Iranian) expansion into the region and all of this blundering about imperils our only true ally in the region, Israel. And we seem hellbent towards repeating this folly in South Asia. There is a Green Curtain falling from across North Africa to West Asia and onwards into AfPak and we are doing our best to expedite the descent. God save us from our clueless State Department and Pentagon policy makers. This operation was akin to Beslan and the Moscow theater. It was a murder-suicide gambit from the very first. The ‘demands’ were preposterous. There was absolutely no possibility of escape and evasion as an end game. Algeria has been through this before, and before, and before. Harsh experience has informed them that all such ‘negotiations’ are shams – – mere media operations for maximum publicity — so that their own deaths can be celebrated lore among their buddies. Like Flight 93, the civilians were dead men walking the moment they were captured. The harrowing accounts of those that escaped make it crystal clear that they knew that to be true — from the outset. There is absolutely no history of anyone ever being negotiated out of AQIM possession.